Once there was a geocacher who hid a geocache. Because he did not want to put the plastic box naked behind a bush, he wrapped it into a plastic bag. Again and again when a GPS treasure hunter visited the box, then the box was allowed to come out of the plastic bag for a short time. From time to time more and more of the surroundings gathered itself into the plastic bag, too. When it rains the box has to lie in the water, because the water found a way into the bag. Slowly but surely the mix into the plastic bag started to be moldy. From now on the further visitors treated the box not very good. They took the bag with two fingers or with gloves and shaked it till the box bangs on the floor together with a splash of water. To re-hide the box the procedure wasn't even better. But the box would prefer to lie like Adam and Eve, only covered with a few leaves. So from now on the rain could wash the box and the sun could dry and warm it. I think all of us can sympathize with the box and knows this situation very good. But why does it always happen to the boxes again and again ? 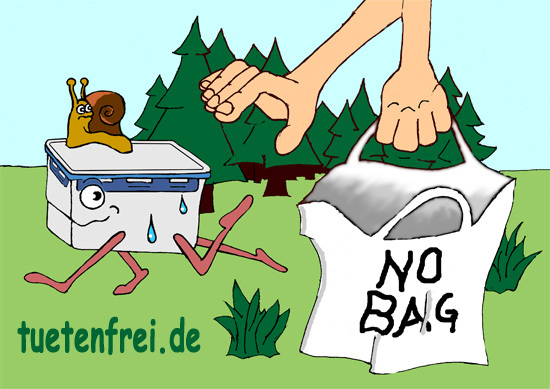 Anyone who hides a geocache without any plastic bag may insert an unchanged picture from my website here. The size of the picture can be changed of course.